Welcome, from our friends over at CAD Interiors! Matt and I are so happy to once again be part of designer and blogger Jessica Rey’s home tour! We run French & French Interiors in Santa Fe, and this summer we’ll be treating you to some classic desert designs done in our signature style. We built our home three years ago on seven acres just outside the city. It’s been a lot of hard work getting to this stage, but it’s also been an incredible adventure to create and design this home together. I love using our home as a proving ground for designs we want to try out. While it’s exciting to have the freedom to be so creative, it can also be challenging at times…our design “project” is never really done! Lucky for you, that also means we have a constant rotation of interesting things to share. One of the first things you’ll notice about our home is the diversity of design included in each space. I have minimalist pieces and bold statement-makers, stark white and lots of color, new store-bought items and tons of vintage finds. This mix really reflects our family’s eclectic interests, and I think it emphasizes the fact that you should never be afraid to experiment! If you love something, pick it up and find a place to make it work in your design. I fell in love with this vintage French settee, and used the bright color palette of its nobilis fabric to welcome visitors into our entryway. These colors repeat as you move into the dining and living area, which you can see in both the chairs and light fixture. Against such a sunny bright orange, I chose muted tones and natural textures for the floor coverings. Also notice the layering of two different rugs – this is an easy way to add visual interest to a large space. We painted these vintage chairs white, but left the table in a natural wood finish. These play together against all the other white surfaces to create a look that’s engaging but not overwhelming. On this side table, I usually rotate seasonal decorations. This is a great location to display pieces that might not exactly “match” anywhere else. Lovely statement pieces will speak for themselves, and you shouldn’t be afraid to give them the opportunity! In this main living area you’ll notice we take things a bit warmer than the more formal entryway. You can use lighting and design elements to give a space a slightly different feel; we did both here with a tall lamp and the rough-sawn wood ceiling. I also kept the large furniture in solid colors, but couldn’t resist a bold pattern on the floor! The big abstract portrait on the wall is of our daughter Isla by artist Nigel Conway. I try to collect custom pieces like this that are both beautiful and meaningful to our family. I think this is one place where you can really begin to put some heart and soul into your designs! In the summer I keep our table setting bright to reflect some of the warmth from outside, and I never have to worry about it looking too busy against the cool gray bookshelves that frame our wood-burning stove. I always try to incorporate natural elements because I think they play beautifully against all the “indoor” things we use daily. This includes my plants of course, but you’ll also notice some of the books are arranged to form a mountain-like vignette. This kitchen is one of my favorite places to be in our home. We intentionally built it to be very open to the living area, so nobody ever feels isolated doing all that fun family food prep! Here you’ll see more bright white elements combined with natural wood, which reflects the gorgeous outdoors view over our farmhouse sink. The open shelves on either side of our range hood, clear light fixtures over the island, and lofty ceiling also contribute to the airy feel. In our master bedroom, you’ll see even more patterns and layered textures done in a classic calming blue and white scheme. Matt and I always custom-make the pillows for our bed, instead of using the regular ones that come with a sheet set. Using patterned pillows (like what you’d see on a sofa) is a very simple way to up the design factor in a bedroom! The bedding patterns complement our art choices from around the world as well. I found the large Moroccan wedding blanket at a flea market for just $80, and we mounted it to the wall with carpet strips on a 2×4. The pair of blue prints above our bed were a gift from a world-traveling family friend, and the colorful bench at the foot of the bed is made of vintage saris! I like to use small-ish sheepskin rugs on either side of the bed for a luxurious warm feeling on your feet first thing in the morning. I also love our natural wood ceilings here, and the brass chandelier that Matt made is just perfect for keeping the space lofty but warm. The picture window above our soaking tub showcases one of my favorite views from the house! We’re so lucky to be able to build our home and family in this beautiful landscape. Our industrial-style vanity from Sig Hardware is functional without being too heavy. I found the pair of flower paintings by Thomas Pell at a garage sale! The pendant lights above the vanity are actually vintage mercury lampshades. In Isla’s room we keep things fun and creative, and try to give her ways to express her style too. 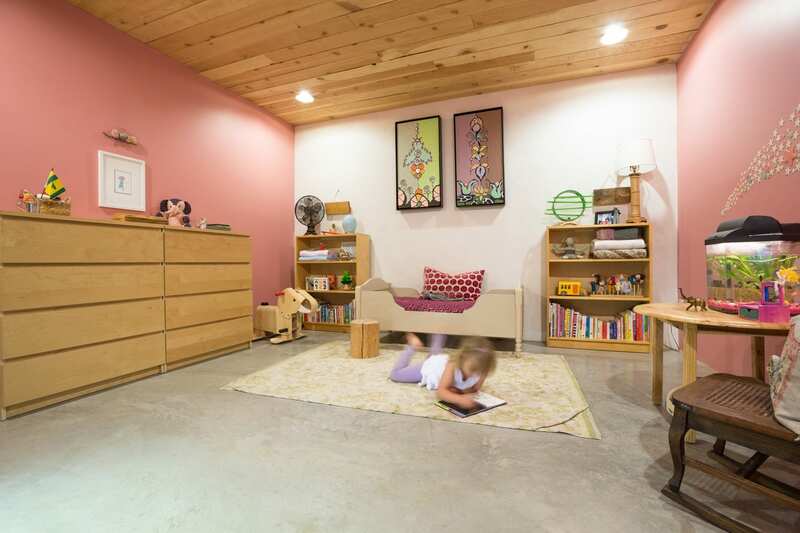 Kids may not be expert interior designers (yet! ), but their innocent ideas can be so amazing! I think my favorite thing about her room is the plastic glow-in-the-dark stars. Instead of spreading them out to cover the whole wall, we put them into a tight shooting star pattern that she loves. This is such a cool way to showcase a bit more of the natural world indoors! The pink pillow on her bed is a fabric by designer Manual Canovas, and the toddler bed itself is from Restoration Hardware. To add some whimsy, we hung up the pair of paintings by one of my favorite artists, Bethany Forloney. Thanks so much for stopping by to tour our place! We hope you enjoyed learning more about our style at home, and that you can take some of these ideas to design your own spaces. Be sure to check out the next stop on the Home Tour, over at Maker of Home. heather, i always love your tours because you show so much of your home and i love to see how it all flows so beautifully. love the light warm wood throughout- you have such a unique and distinct style which makes your home feel welcome and fun! Wow – your home is gorgeous. Those ceilings are amazing, and I love all the global touches. Also, that light in your bedroom is just so so good. And yeah, totally jealous of those views! Heather, I need that settee and your whole dining room set up!!! STAT! LOL! I never thought I would say this, but you make orange look so dang on GORGEOUS! Also, I think you may have just inspired me to put pine wood planks on my ceiling. I have been thinking about doing something like this but wasn’t sure, but your home looks so beautiful with it…I may have to pull a similar move. Your entire home is otherworldly!!! The texture, the color, the design … it truly stands out. I love your flair for collecting and love your earth inspired home. Your great room … omgaaaah!!! Heather… This was the perfect grand finale for my version of the tour! I just love your home… The natural wood tones, concrete floors, and warm colors are so inviting. You have great taste in artwork, too!! Oh, and I love how you scattered design tips throughout your post… Thanks for sharing!! I am always in awe of your work and aesthetic..I love how it seems so warm and welcoming(even familiar in a sense) all while maintaining a modern edge/”cool” factor. This is something I am trying to learn how to master myself and I feel like a sponge when I visit your site (soaking up all the inspiration). 🙂 Like I said…you are a design rockstar to me. Love your home, friend! What an inspiration working with you all! it is always refreshing anything you design, show and or share! Your home, your girls, your style… so beautiful. OO I LOVE YOUR STYLE SO MUCH! AND I’M TOTALLY JEALOUS OF ALL YOUR VINTAGE FINDS – SO MANY PRETTY PIECES! YOU HAVE A GORGEOUS HOME – SO HAPPY I FOUND YOU AND YOUR LOVELY BLOG! CAN’T WAIT TO SEE WHAT YOU DO IN THE DINING ROOM. THOSE OUT-OF-FOCUS LAMPS ARE THOROUGHLY INTRIGUING. SUCH a beautiful home tour! Your kitchen is dreamy and I’m in love with those super tall lamps in your Great Room. Your brass finds are fabulous and the vintage mercury shades in the bathroom are beautiful. I also love that shot of the tub with the pretty vase of flowers. You’ve filled your home with so many cool and interesting things that make such a wonderfully memorable impact on a reader!! Your home and views are stunning!! Absolutely love your kitchen and your bedroom/bathroom are one of my favorites! So unique and full of beautiful details!